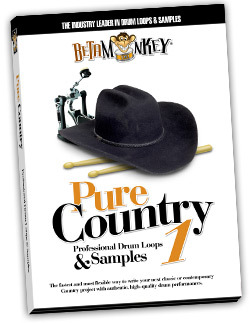 Beta Monkey Music’s Pure Country I: Rocking Nashville™ captures the authentic sounds of Nashville with over 500 acoustic country drum loops in nine (9) different Groove Folders™ and a complete matching multi-velocity set of drum samples. This complete country songwriting package features live drums laid down with authority and feel in one of Nashville’s best drum rooms. Pure Country I: Rocking Nashville™ will deliver true Nashville inspiration. 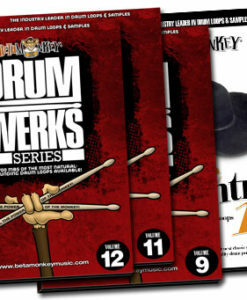 Big, Hard-Hitting Rocking Country Drum Loops straight out of Nashville! We wanted to capture the heart and soul of modern country and country-rock music, so we headed down to Nashville. Beta Monkey Music’s Pure Country I: Rocking Nashville™ is an all-new release, capturing the authentic sounds of Nashville with one of the town’s best studio drummers on a powerful set of Yahama Recording Custom drums. This is complete modern country songwriting package, featuring over 500 acoustic drum loops in nine (9) different Groove Folders™ and a complete multi-velocity drum and cymbal sample set . If you need real live drums laid down with the authority and feel of a seasoned Nashville session drummer, then Pure Country I: Rocking Nashville™ will deliver true Nashville inspiration. From ballads and straight-up country rockers to shuffled country swing and high-energy double-time beats, Pure Country I: Rocking Nashville™ will cover a wide range of your country and country-rock songwriting needs. Authentic Country Drum Tracks: We went straight to the heart of Country music in one of Nashville’s premier drum rooms. Add a seasoned pro behind the kit, with both the playing skills and knowledge of the genre and you have the absolute authority on brushed country drum loops. Versatile Grooves for Modern Country: Over 500 drum loops, covering ballads, straight-ahead mid-tempo feels, shuffles, trainbeats, tom grooves, double-times and more. If your music needs big, powerful drums for country music songwriting, Pure Country I: Rocking Nashville™ has it covered. Complete Song Elements: Main grooves, groove variations, fills, intros and endings – all the parts you need for songwriting are included. A complete songwriter package. All the pieces are in place to put together your next song quickly and easily. Cohesive Drum Sounds: All drum loops are taken from the SAME recording session (all grooves, fills, one shots, etc. are sonically-matched). The bottom line here is maximum versatility. 524 (625 MB for 24 bit; 424MB for 16 bit) original, license-free country drum loops. 16-bit, 24-bit ACIDized WAV, APPLE LOOPS/AIFF, REX2 formats. 91 (72 MB for 24 bit; 48 MB for 16 Bit) multi-velocity drumkit (kick, snare, toms) and cymbal samples (hihat, ride, crashes). 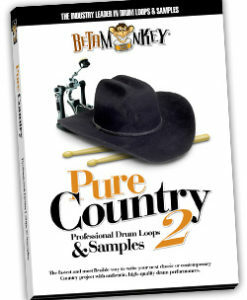 Fantastic drum loops for country music songwriting styles. This kit sounds great and fit perfectly for the style of my music (new, more rock-influenced country). 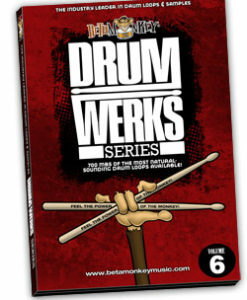 If you’re after real, acoustic drums, these are an excellent resource to get more songwriting done! Man you kill me! Good product and good business practice….. are you sure you are located here in America? Well put it this way….. if I had Pure Country vol 1.APPLE… sadly there would be nothing left for me to buy. Then I would go into a slow decline, with bad loop withdrawls……neurotically checking the website 3 times a week for new drugs….. I mean drums. I am not addicted. Dude thanks again. I’ll be looking forward to your new stuff. Keep up the awesome work !